Following machines of our business partners Beltron, Hilger and Kern, Modus, Nordson ASYMTEK, Nordson Dima and KC-Products are available for trials in our technical centre. When you come to visit our site in Kempen you may receive both comprehensive advice and an on-site presentation in theory and practice. 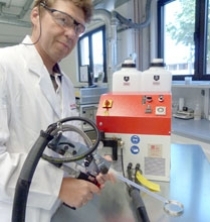 This selective coating machine comes with two application units: a spray head and a dosing unit, thus permitting the one-step application of both a gel protecting connector strips and a conformal coating. This selective coating machine for conformal coatings stands out for its high acceleration/deceleration. The film coater method ensures a high edge definition and an even film application. What is more, it can be fit with Slim Swirl multi-functional heads, a jet valve and a dosing unit. Thanks to the slim and long nozzle forms of the Stream Coat System, any areas that are difficult to access can be selective-coated easily with a conformal coating. This machine is distinguished by a low overspray application; even highly viscous thick film coatings can be applied by dispensing. Suitable for a bubble-free encapsulation of casting compounds, this mixing and dosing unit with electronic control is compact, transportable and easy-to-handle. The mixing ratio can be adjusted variably. Designed as a UV continuous dryer, this small-sized yet powerful lab equipment is equipped with 2 lamps (gallium and mercury) which permit an extremely rapid curing of standard UV systems. The lamps are height-adjustable; this way, it is possible to cure assemblies of up to 10 cm of height. The UV LED module provides high efficiency: Compared with common Hg lamps approx. 80 % of the electrical power consumption and heat can be saved or avoided. Curing is effected in a narrow wavelength range around the emission maximum of 395 nm – in general, it requires a modification of common UV systems. In a separate climate room, a number of test chambers are available for temperature and humidity stress testing, thermal shock tests and Environmental Stress Screening (ESS) within a temperature range of -40/+180 °C and/or -80/+200 °C, based on a change rate of up to 100 K per minute. This is the equipment we use to test the reliability of our own products on standard specimens. We also offer climate tests of finished assemblies. In addition, a technical centre for Elpemer® products is available where all steps of photoimageable solder resist processing can be performed.